My mom used to make stuffed peppers for dinner when I was a kid. They were green, stuffed with ground beef and simmered alongside huge meatballs in a huge pot of red pasta sauce for several hours. I wasn’t a huge fan of them as a child, mostly because of the bell pepper part. I usually opted for a meatball instead, chopping it up over a bed of rice and smothering it with extra pasta sauce. As an adult though, I’ve grown to enjoy bell peppers and missed the comfort of them being stuffed and served with homemade sauce. Wouldn’t you know, the first time I tried to replicate her recipe was a complete and utter disaster. The stuffing came out of my peppers, my meatballs never cooked through and I had no clue how to even begin to eat this monstrous pot of seemingly random mixed up food. Not too long after we got married, I proposed the idea of stuffed peppers to Mr. Crumbs. He’s not a big fan of ground meat, so stuffing them with ground beef was clearly out of the question. But not wanting to disappoint his eager-to-please-new-wife, he asked if I could do it with chicken instead. Hmm… I guess I could do that. They wouldn’t be the same, but that doesn’t mean they would be bad. It’s now nearly eight years later and the tradition of stuffed peppers has officially been passed on. Granted, my method is different, and my stuffing is different, but the deliciousness and comfort that comes from a hot homemade meal is still the same. When you’re picking out peppers for this meal, try to get the biggest peppers possible so you can buy fewer and split them in half to stuff instead. If you can only find smaller peppers, allow one full pepper per person, possibly two for teenagers and dads. In either case, aim for peppers that are 75¢ or less to keep this meal frugal. This meal is PERFECT for making ahead and freezing. See the specific instructions below if you happen to stumble across a plethora of bell peppers and you’re not sure what to do with them. Preheat the oven to 400F and bring a large pot of salted water to a boil. Meanwhile, prepare the peppers by washing well, cutting in half (through the middle, not from the top down) and removing the seeds and white pulp the pepper. Place cleaned peppers in the pot of water, boiling for 5 minutes. Remove and let cool. In a large bowl, combine cooked chicken, cooked rice, creamy cauliflower sauce, seasonings and ½ cup red pasta sauce. Taste and season with salt and pepper, adjusting seasonings as desired. When peppers are cool, spoon ¼ cup of red pasta sauce into the bottom of a 9x13 glass baking dish. Smear around, covering the entire bottom with a thin layer of sauce. Place peppers in the baking dish, cut side up. Fill each pepper evenly with the chicken and rice mixture, pressing the mixture into the peppers well so that they are truly "stuffed." Fill each pepper approximately ¾ of the way full. 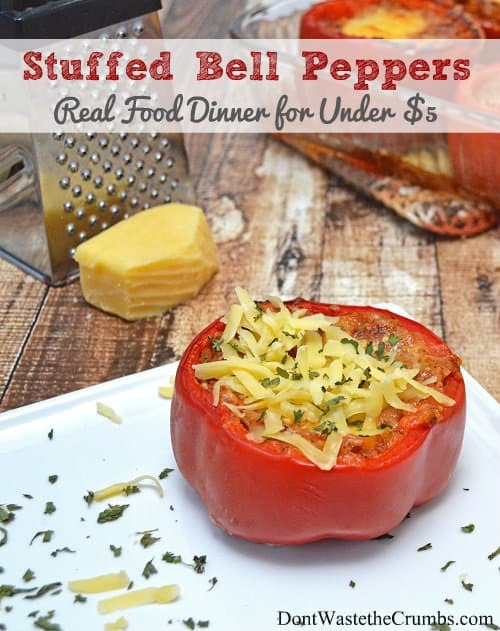 Top each pepper with approximately 2 Tbsp of shredded Monterey jack or mild cheddar cheese. Bake in the oven for 15-20 minutes, or until the cheese is melted and the peppers are hot. If desired, place peppers under the broiler for 2-3 minutes to brown and bubble the cheese. Serve hot with the optional Parmesan cheese sprinkled on top and the remaining ¼ cup red pasta sauce, if desired. My mom traditionally served this with white rice and extra red sauce, but I’ve eliminated both of those in order to reduce our consumption of grains and stretch our homemade sauce and choose to serve with a side veggie and a salad instead. Feel free to add one or the other back in. If you have picky family members, choose a sweeter pepper like red, orange or yellow. The current Dirty Dozen lists “sweet bell peppers” at #7. Whether this includes the green bell pepper or just the red/orange/yellow/brown varieties, I’m not sure. My advice would be to buy organic if you go colored, or choose a green pepper instead. Sausage Variation: Substitute 1/2 lb spicy ground sausage (cooked) for the chicken and creamy cauliflower sauce for the red pasta sauce. Double the spices and add 1/2 tsp dried onion powder and 1 tsp dried garlic powder. Ground Beef Variation: Substitute chicken with your favorite meatloaf recipe, prepared up until the baking step. Remove and unwrap as many peppers as needed. Place each pepper upright in an appropriate sized glass baking dish that is smeared with red pasta sauce. Allow to thaw to at least refrigerator temperature, then bake at 400F for 30-40 minutes until warmed through. Top with shredded cheese and continue to bake until the cheese is melted. Serve hot with optional Parmesan cheese and/or additional red pasta sauce. What’s your favorite meal from childhood that you’re now making for your own family? Is it the same recipe? Have you made it healthier?